Cut the meat into mouthful chunks. Add 1 tablespoon of salt and mix well with your hand. Heat the oil in a large pot over medium heat. Add the meat chunks and fry until lightly browned. Add the onion. When the onion begins to soften, add the carrots and fry for 5 minutes. Add the water and remaining salt, and increase the heat. Boil for 5 minutes. Add the rice to the pot and stir with a perforated spoon. When the rice begins to absorb the water, lower the heat to medium and cover the pot. Steam the rice for 30 minutes, stirring once in between. Serve warm. En sevdiğim pilav Tükmen pilavı ! sağolasınız ! Thank you so much for sharing this recipe! I made it for my project around the world in eighty dishes and it was delicious. I love your blog, it’s beautiful! 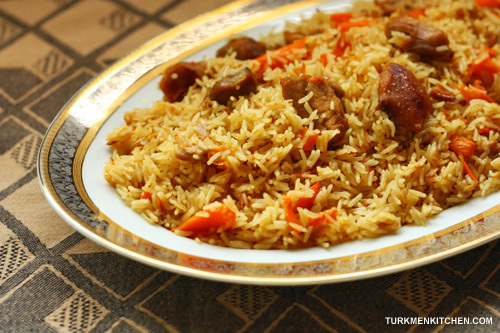 Çok teşekkür ederim bu recipe’yi paylaşmak için! Gelecek yılbası’da bu Pilav’ı yapmak istiyorum! Thanks Karni! Hope your palaw turned out good. Siteyi bugun keshfettim ve chok duygulandim, gururlandim. Bundan sonraki ishlerinizde basharilar diliyorum. Elimden geldigince bu siteyi yaymaya gayret edecegim. Turkmenistan’dan, Ata Vatan’dan selamlar! hi, how to make the rice turns yellow? Hi Fanny, the rice turns yellow from the carrots so you can try finely slicing some of the carrots so that they melt and/or add more carrots. Байрамгуль, я горжусь вами!!! Молодцы! Gul yaly boldy sag bolun. Yone duzy 2 cemce dalde 3 cemce has yerinde boldy mende. Et gowuranda yumusamalymy ya gaynadanda? Ilkinji gezek edemde et gatyrak boldy. Birem palawy nadip biri birine yapysmaz yaly etyan? Et gowrulanda ýumşamaly, ýagny bişmeli. Eger şonda et gatyrak bolsa suw guýanyňdan soň pessejik otda köpräk gaýnatmaly. Palawyň bir-birine ýelmeşmesi tüwiňe bagly. I recommend boneless cuts of beef. Good luck! So here’s a North American question: what changes would you suggest in the recipe if made in an “Instant Pot” (the Canadian counter-top electric pressure cooker / rice cooker / yogurt maker)? It has a “saute” function which I would think should work for browning the meat and softening the onions and carrots, and bringing the water / broth up to hot before adding the rice. Thanks a million for your website. Turkmen are great! Assalamualikum. The recipe looks yummy. Hoping to try it the coming week for our Turkmenistan guests.